Looking for a Local Contractor Near You? Elevation Roofing & Restoration of League City is among the best roofing company in League City, TX that is being trusted by homeowners and business owners when it comes to their roofing needs. Through our specialized roofing industry knowledge and commitment for excellence, we have managed to establish an unblemished reputation as one of the top roofing contractors in Houston metropolitan area and Galveston County. It is essential for every property here in Texas to have a properly maintained and well-protected roofing system, especially that the said state is known for its unpredictable weather. For that matter, it is of great importance that roofing contractors, especially those serving League City, TX and its nearby communities should have the proper knowledge, equipment, and more than enough experience to handle any roofing concerns that is being influenced by League City and Texas climate. When it comes to addressing the roofing needs of the property owners of League City, TX and its nearby communities, Elevation Roofing & Restoration is already a tested and proven roofing contractor. 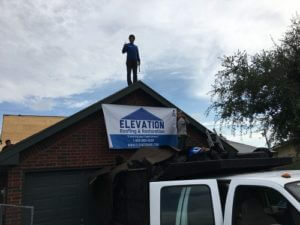 Elevation Roofing & Restoration of League City has been providing roofing services to the homeowners and business owners of the area for many years now and counting. We specialize in all types of roofing, including residential and commercial roofing, which allows us to be more versatile and highly skilled as compared to our competitors. Know More About Us! Elevation Roofing & Restoration of League City continuously rise above the challenge of the roofing industry of Texas. We consistently aim to be on top of your list as your dependable League City residential and commercial roofing contractor. For that matter, we consistently provide up skill training and seminars to our team of expert roofers, technicians, installers, artisans and project managers. We always see to it that before we send our personnel to your home or place of business, they are highly qualified and competent to deal with your roofing issue or concern, regardless of its size and complexity. Elevation Roofing & Restoration of League City is a firm believer that well-informed property owner like you will surely arrive at the best and most appropriate decision, which will also help avoid regret after any roofing or any home remodeling project. In view of such circumstances, Elevation Roofing & Restoration of League City always present honestly to clients the roofing services and other property improvement service we offer that is consistent with the Building Code & Standards. As to any roofing project, you can always turn to us for help. We specialize in various roofing services including but not limited to roof replacement, emergency repair services, residential asphalt shingle roofing, and commercial rooﬁng services that involves TPO, modiﬁed bitumen, PVC, and metal roofing products. Here at League City, TX, we are your one-stop roofing service contractor. Whether you need roof installation, roof repair, roof maintenance, and other essential roofing services, you can always rely on our experience and expertise to deliver you a successful and lasting roofing project. Contact Us Today to Know More of Our Services! League City, Texas is a located in Galveston County, which is also within the Greater Houston metropolitan. The city has an estimated land area of 137 square kilometers, making it the largest city of Galveston County to date. Apart from being a residential and commercial community, League City is also home to several waterside resorts, making it a popular tourist destination, both local and foreign tourists alike. However, before becoming a progressive city, similar to other cities in the United States, League City also has a humble beginning. The city was first settled by three founding families, namely the Perkinses, the Cowarts, and the Butlers. From the pioneers of the 1800s, League City managed to grow in terms of population and industry. As of the most recent census, there are around 102,000 people residing in League City. And from thereon, the residential and commercial environment of the city has managed to improve over the past years. Together with the growth and expansion of League City, the need for various services has been felt, especially those involving the care and protection of each property’s roofing system. With such need of roofing services, roofing contractors and roofing companies have also proliferated in League City. Hence, ensuring homeowners and business owners of reliable and trustworthy local roofing services.